[Episcopal News Service] R.E. Lee Memorial Church in Lexington, Virginia, where Robert E. Lee once served as senior warden will no longer honor the Confederate general in its name. 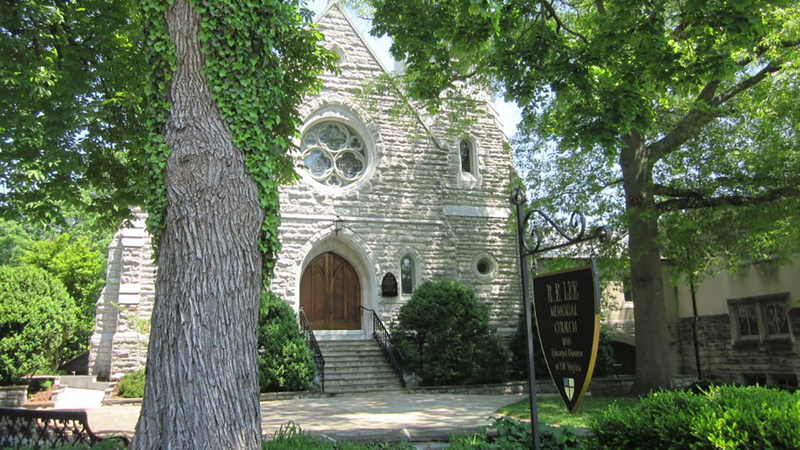 After two years of tense debate in the congregation, the vestry voted, 7-5, on Sept. 18 to change the church’s name to its previous Grace Episcopal Church. The decision had been backed publicly by Southwestern Virginia Bishop Mark Bourlakas, who spoke to the congregation earlier this month. “It’s been a costly process both spiritually, financially and emotionally for the congregation, but I’m proud of their work and encouraged by it,” Bourlakas told Episcopal News Service by phone Sept. 19. The vestry’s past inaction on the name had prompted some to leave the church. Others were steadfast in favor of keeping the name to honor Lee. Episcopalians on both sides of the issue filled the church when Bourlakas spoke there Sept. 7, and they again gave competing views this week before the vestry’s vote. Violence last month during a white supremacist rally in Charlottesville, Virginia, has amplified the national debate over Confederate symbols in public places, including at Episcopal institutions. For many of those institutions, the debate began two years ago after the massacre at a black church in Charleston, South Carolina, by a gunman with Confederate sympathies. Hate groups chose Charlottesville because of that city’s decision to remove a statue of Lee. Clashes with anti-racism counterprotesters ended in numerous injuries and the death of one counterprotester. Washington National Cathedral in the nation’s capital responded by removing stained-glass windows depicting Lee and a fellow Confederate general, Stonewall Jackson. Christ Church Cathedral in Cincinnati, Ohio, launched a study of its own memorials to Confederate figures after the dean called for their removal. Defenders of such memorials have warned against hiding history, and some say Confederate generals displayed heroic qualities despite fighting on the side of the slave-holding South. Those arguments have been countered by critics who rebuke efforts to portray the Confederate cause as noble. The congregation in Lexington faced the additional challenge of confronting the legacy of a Confederate figure closely tied to its own identity. Members of Lee Memorial Church spent several months in 2015 discussing the church name in light of the Charleston shooting. After surveying the congregation and hearing a range of opinions for and against, the vestry narrowly voted that November to keep the name unchanged. Then in 2016, the church hired an outside consultant and formed the Discovery and Discernment Committee of vestry members and parishioners to more carefully pursue reconciliation among the congregation and decide what actions to take. 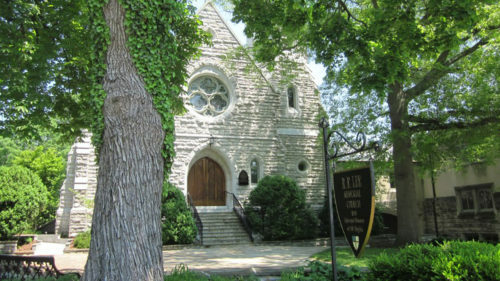 The committee and consultant issued a 15-page report in April 2017 that summarized the various perspectives on the church’s name and recommended “that the name of the church be officially restored to its former name of Grace Episcopal Church.” The vestry met the same month to review the report and accepted all the recommendations, except the one urging a name change. The discussion reignited after the violence in Charlottesville renewed questions about whether it was appropriate to name a church after a Confederate general. With members of the vestry still resisting a change, Bourlakas took a more active role in the conversations, visiting the church in late August and coordinating a three-city lecture series on racial reconciliation that kicked off in Lexington on Sept. 13. The bishop, in recommending a name change, tried to focus the congregation on its Christian mission, which he said should not be hindered by distractions like disagreements over a name or Confederate statues. That was brief and to the point, Ed, but fails to honor the difficult discernment process of this parish. I applaud them for this move, not as a way of “rewriting history” but rather as a return to a previous identity that was not bound up in a single person but in the grace of God. Truly, an extension of grace. NO, as an outsider, I see this decision to be one that righted history…Lee was a pro-slavery person and worked hard at defeating the Reconstruction efforts. While he took an oath of allegiance to the US he broke that oath by joining the confederate army, while many of his Virginia military officers fought with the North. He was saved from a charge of treason by General Grant. He also separated a slave family of his, selling the woman to one family and her child to another. So, it is not hatred motivating the name change; it is reverting to a past name. May Grace Memorial Church continue to spread God’s message of peace, love, and salvation in the name of our Lord and Savior Jesus Christ. Is there any other way? I recently read a modern biography of Robert E. Lee titled PATHS OF GLORY : THE LIFE AND LEGEND OF ROBERT E. LEE by Michael Korda , who had access to a number of records not used previously by other biographers . I also am reading RECOLLECTIONS AND LETTERS OF ROBERT E . LEE . When I was a student at Hobart College in Geneva , New York , we all had to take a course in American history . The main text used in the course was by Morrison and Commager , highly reputable historians . They said that Lee was a truly great American , of the same caliber of character as George Washington . I suggest that people read for themselves , and not form prejudiced opinions not based on historical fact . Respectfully Submitted for Your consideration . Richmond Parker , from Yankee -Land in Central New York . You need to read more bios on Lee. Michael Korda’s book is considered a hagiography. The NYTimes pointed out some very serious flaws in Lee. I suggest you widen your reading on Lee. I imagine all of us could have some “very serious flaws” pointed out. It’s terrible we’re are allowing radicals on “both sides” to dictate our decisions. This is the best decision. Lee himself never wanted his name to interfere with the reconciliation that he worked for after the War. I think that he would prefer art and statuary of him (if it must be) to show him with books in his hands. Perhaps another view would be of him kneeling for Communion beside a former slave. Notwithstanding, the noise that made this change happen is disturbing. That feelings. ignorance and caricatures would become a credible basis for evaluating issues and reputations is doomed to disaster. At the end of it all it must be remembered that the Congress valorized and made all Confederate soldiers United States veterans. After the War both North and South reconciled and Confederates were given amnesty to just go home without shame or blame attached. It was as though it was finally seen that powerful forces had trapped the country before the War and both sides regretted their acts, but firmly believed that they acted on honor. This is not finished. Thomas Jefferson and George Washington will soon be under the iconoclast glare. I grew up in New England, where I learned that northern Protestant churches were in the vanguard of the abolitionist movement. It was many years before it dawned on me that southern churches were pursuing the exact opposite position. Ultimately, slavery was abolished at a great price for both sides. The South was not punished, rather precedence was given to reconciliation and healing of our nation. I would hope that, from our perspective of well over a century, we could all agree to continue that concept of reconciliation and healing, and now also recognize that blacks were never included in that process, nor have we ever fully acknowledged the damage done to those held in slavery. Please, let us pray for healing in our nation, for welcoming people who may not agree with us or look like us. Can we try to hold love in our hearts, rather than judgement, and seek peace among our people. I find it interesting that some are upset by a Church reclaiming its original name. An Episcopalian for 58 of my 71 years, I have always treasured the tendency of our denomination to name Churches for Saints or religious precepts, not for individual mortal humans. Discernment and civil debate over such a serious issue has apparently found an answer for the communicants in Lexington. We should respect their decision and only wish them God’s peace, this day and always. This entire sense of “purging” is a tragedy for our church. Of course to insult “poor, clay-eating” southerners seems to be acceptable. Sadly it shows the ignorance of “activist” in our church. What makes it less painful is to realize how few people care one way or the other what the Episcopal Church does anymore. Enjoy the purging of history and the ridiculous actions of the radical left, but do realize that because of behavior and actions like this the Episcopal Church will continue to decline. The stain glass windows of Lee and Jackson were in the National Cathedral to show that we were again a “united nation,” certainly not to promote slavery. The Cathedral actually had the gall to “deconsecrate” memorials that were given and installed in the Cathedral. I have to say that at this time I am ashamed to be an Episcopalian. One wonders if the members of the parish were given an opportunity to vote in this decision and were in agreement with the decision. My guess is they were not and the decision was made by the Vestry. I hope my guess was wrong. How nice to follow the USSR in an attempt to re-write history. One cannot change history. It is what is. How sad that the PC folks have taken over. Now that this has been done, it will be interesting to see how quickly this church grows and prospers. I suspect ENS will not tell us. The argument that changining the name of the church back to the original name is “rewriting history” is a specious one. You said in your own reply that one cannot change history. One can rewrite history books in a biased way, which undoubtedly what the Soviets did (quite common in authoritarian regimes). Glorifying a man who turned his back on his country and served a rebellion whose purpose was to continue a system of enslavement in the economic interests of the South, is simply wrong. The Episcopal Church is one who proclaims the all are welcome ( there is no but…). If I were African American I would call that hypocritical and would certainly not feel welcome. As some have said in their replies that Lee had admiral and heroic qualities does not alter the fact of his treason against his country. I’m sure there were many Nazis in WW!! who had admirabli traits and heroic qualities, but I doubt that there are any memorials are churches named after any of them. I will be pleased to attend Brace Episcopal if I find myself in Lexington. I doubt if I would be without the name change. The church did the right thing. I thought David Paulsen would have served us better had the headline emphasized the restoration of the original name of the parish and the heeding of General Lee’s wishes. That we have Confederate dignitaries associated with Episcopal institutions is certainly, to borrow a phrase, an inconvenient truth. That we have bishops who held Conventions knowing that blacks would not have equal access to hotels and restaurants, yet did nothing is another. “They were men of their times,” we used to say. The history I read tells me that our country would not have been founded at all had it not been for the compromise over slavery. That seems to be the inconvenient truth we can’t yet address. Going back to re-fight the 80 some-odd year run-up to the Civil War will only encourage revenge and more regret. The past can’t be changed, but it can be redeemed. The means of redemption have been the subject of the past several Sundays: Christ, Cross, Reconciliation, Forgiveness, Grace. I think the Presiding Bishop has us on just the right path. Let’s worry less about keeping up with the latest politically correct issue. Let’s focus on this part of the Jesus Movement and see where he takes us. Emotive based, Stalinist historical revision and sanitation. Isn’t Lee buried in the church? What happened to all the Confederate flags in the church? Too bad that the congregation did not have a Congregational meeting to verify the vote. I am a 1963 graduate of W&L and worshiped in that Church for 4 years. Glad they changed they name back to Grace! There is wisdom in naming a church after one of God’s attributes or one His Saints as is traditionally done. I fully agree that the congregation may change the name of their church to anything that they desire. However, the name change is precipitated by the desire of the EC to be seen an “activist church”, i.e., a church that is easily led by folks who are determined to destroy our country. Also, where is the “forgiveness for our sins” that Christians [Episcopalians] espouse? As others have previously sadi, in this thread, these types of actions [removing statues, changing names] remind us more of communism than our society. BTW, why does the EC not talk about the violent radical left group, which attacked the group that had a permit to march? Forgiveness? Seems to me it’s bound up in Grace. That General Lee himself was evidently opposed to the creation of memorials in his honor would have been reason enough to oppose the renaming of Grace Church in 1903 despite his intimate association with the church. But the decision by self-righteous vestrymen to revert to the original name 114 years later, despite their denials, is clearly a political act motivated fundamentally by the left-wing proclivities of the day. I am cynical enough to suggest that there may be a few parishioners at the church who regret their having no stained glass to remove as has the Washington National Cathedral. In any case the whole affair is another black mark against today’s Episcopal Church which will cause far more people to leave than it will attract. Joel Morris stated that all are welcomed in TEC and there are no buts. Really? I’m beginning to doubt that. To borrow from the novel Animal Farm, All are equal but some are more equal than others. Replace the word equal with welcome and you have the Episcopal Church in a nutshell. If you don’t believe that just ask any conservative member. And just for the record Joel I AM African-American and would not feel unwelcome in the least if I worshiped in a church that had confederate images on the stained glass. I tend to be old school and judge how the people in the congregation treat me in deciding whether or not I am welcomed. If I feel unwelcomed in TEC it is not because of any confederate symbols that might still be in a parish. It is because of my conservative viewpoints. In this denomination conservatives are at best totally ignored by the clergy and many of the members and at worse ridiculed by them. Maybe someday after they are all done congratulating each other on the purging of anything having to do with the confederacy from any and all parishes, maybe, just maybe they’ll get around to welcoming and involving conservative members in the future of this church. If indeed it has a future. Excellent coverage of a complex story of deep discernment by a small community. The only fact that was not disclosed here is that the prior vote that failed was in fact a majority vote but the leadership (rightfully) decided on a supermajority standard for this decision. This had the effect of slowing down the process but getting to the right place in the right way. Proud to call myself an Episcopalian today. Parts of Houston, and its people are still in a terrible mess, parts of Florida and its people are in a state of devastation, it appears that Puerto Rico are to be added to the list, while the church’s efforts and its pride are in a churches name change. Amen to R. Davin’s post about devastation in several states. Perhaps all of us can write a check to the E. Relief and Development Fund. Regardless of one’s political views, people/pets etc. need help now! Church in the Episocplalian faith in the United States do an underhanded and irresponsible act. If you think your decision to rename your church will heal any divisions you are sadly mistaken. What your church has done has deepened the rift that is prevelant in the Episcopal Church in the United States. Churches such as the one in this article decide to drive the rift in the faithful so they can be more in “today’s world.” Compromise to the sad political correctness that drives away members is all about making the church into their own image and not based on faith. There are thousands leaving the Episcopal Church in the United States because of unwise and unwarranted actions such as this church. I may be listed as an Episcoplian officially, but in reality my finances and tithing has not been given to the Episcopal Church for the last nine years. And after knowing about changing the name of your church because you’re ashamed of a truly noble man, I’m glad I made the decision to leave the Episcopal Church and will continue to advise others to do the same. I am not a member of Grace Episcopal Church.